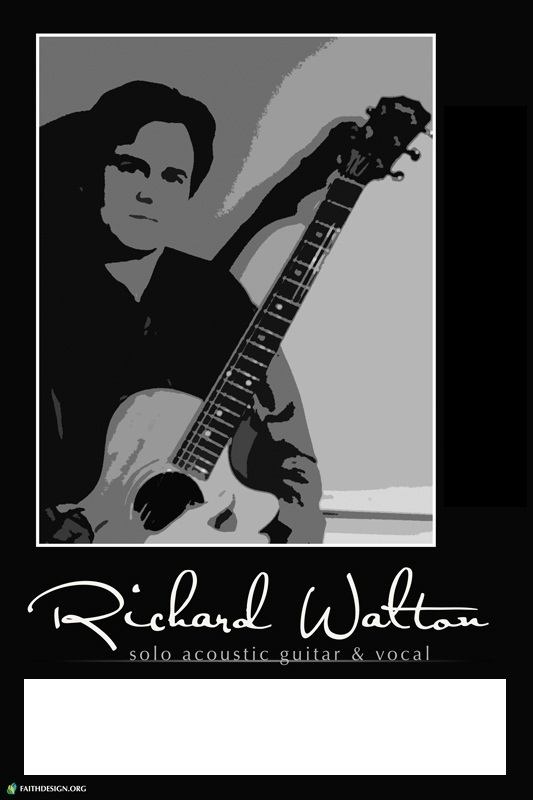 Richard has been a professional, passionate vocalist & solo acoustic performer for over 25 years. He is an award-winning songwriter (42 total awards) & recording artist, releasing 12 CD’s (solo & with Richard Walton Group). He has worked as a solo performer in a variety of situations, including restaurants, corporate functions, coffee houses, schools, pubs, churches, concert halls, weddings, private parties, retirement communities, charity events and house concerts. He has maintained a database of hundreds of fans throughout the years; with Facebook, Twitter & ReverbNation music pages to promote shows, concerts & events. Equipment used in live acoustic performance: Fishman 3300 PA system, QSC 10.2 powered speakers, Rainsong, Taylor, PRS, Alvarez and/or Takamine acoustic guitars, Boss Loop Pedal, Shure & Audix vocal microphones, Yahama and/or Behringer mixers, Behringer monitors, Boss effects pedals & tuner, Vocalist ‘Live 3’, Shure wireless guitar system, foot tambourine, audience tambourines, Hohner harmonicas, etc…. He has received ‘honorable mention’ from the reader’s polls of Music Monthly Magazine as Best Mid-Atlantic Acoustic Performer. Richard also occasionally performs in duo/trio situations with other professional musicians, including: Tecla Walton (violin), Allyson Bridges (vocals/percussion), Kevin Doxzen (percussion), Myles Evans (drums/percussion) , Frank Frazier (bass guitar/vocals), Dave Krug (saxophone), Bryan Miller (guitar/vocals/harmonica), Matt Perich (lead guitar), Larry Ruckman (drums/vocals), Vicki Scarinzi (vocals/percussion), Mitchell Shaivitz (percussion) & Kathy Scarborough (vocals/guitar/keyboards). Along with the extensive catalog of his own award winning compositions, Richard’s solo performances draw from a songlist of over 250 songs by popular artists from the 1960’s to the new millenium, upon requests. Richard’s vast knowledge of the artists and memory of the music/lyrics is nothing short of remarkable. As background music or a crowd engaging entertainer, Richard provides professionalism to every performance. Recently, Richard has been seen working with the following: Richard Walton Group, Rich & Famous, Three’s A Crowd, Rich & Infamous, Legal Tender, Eyelevel, Chalk Dust, Straight On Red, FOG (Five Old Guys), etc… He has been composing, performing and producing original music for 20 years. Educated & trained as a classical violinist at an early age, Richard gravitated towards singing, bass & acoustic guitar. His advanced high school electronic music courses gave him the basic education for engineering & production. 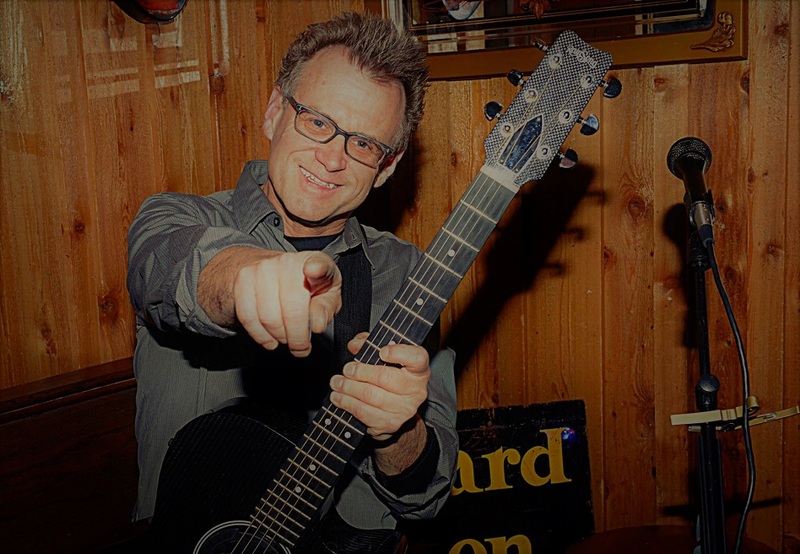 He has released 11 critically acclaimed CD’s to date and received 40 songwriting awards from various international and regional songwriting contests. Richard’s music and recordings can be heard on various radio & satellite stations around the United States. His passion for original music has earned the respect of his peers and the general public. Richard is the founder of The Richard Walton Group (an all-original multi-genre instrumental group, celebrating 25 years!) & Straight On Red (a contemporary acoustic trio). “Savannah Blue” instrumental & vocal CD LIMITED! “Out Of Bounds” instrumental & vocal CD LIMITED!